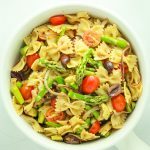 This vegan pasta salad recipe couldn’t be easier! Prep the veggies and dressing while the pasta boils and mix it altogether. It’s great served cold or hot! Spring has sprung! I mean, not really… but let’s pretend for a minute. We’re close enough, right? Close enough to overflowing shelves of fresh asparagus. Close enough to eating on the patio. Close enough to packing away heavy coats and sweaters. Close enough to breaking out the white wine. Close enough to light, refreshing meals like this one. 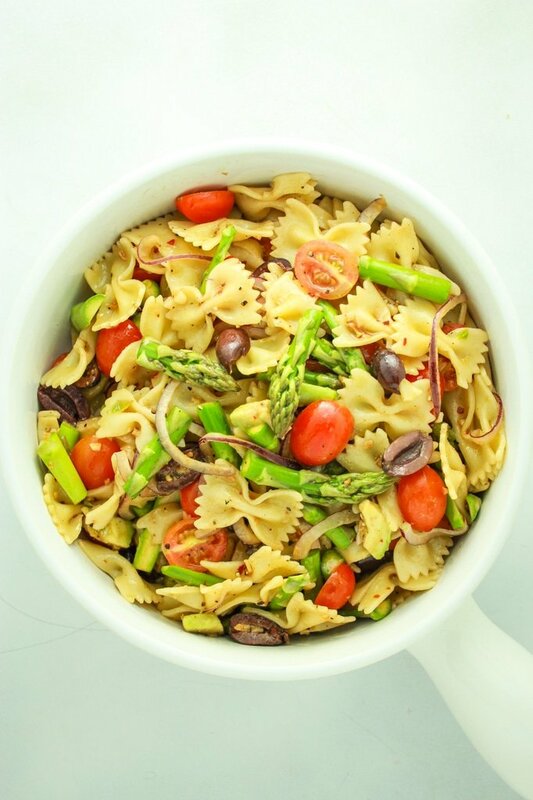 This pasta salad is like spring in a bowl – crunchy arugula, bright and tangy olives, sweet red onion and cherry tomatoes – and adorable pasta bowties. Yep, I said it. Pasta can be cute.  The light, balsamic dressing is what brings it all together in perfect harmony. I can’t resist a good homemade balsamic. I love to keep this kind of food stocked in the fridge for any and all hunger situations. Lunch? Done. Snack? Sure. Heated up for dinner? Yes, please. Easy enough for every day and pretty enough to serve at parties and cookouts. (Psst… if it’s almost spring then that also means it’s almost grilling season! ) Am I rushing things? Also worth noting, this pasta salad is perfect for meal prepping. I store it in my favorite Pyrex containers to keep it fresh all week. You can eat it cold or reheat it – it’s delicious either way! The best thing about this recipe (aside from the fact that it is pasta), is that you can have it done in the time it takes to make pasta. So, if you prep your vegetables and dressing while it boils, the whole dish is done in under 15 minutes. BOOM. 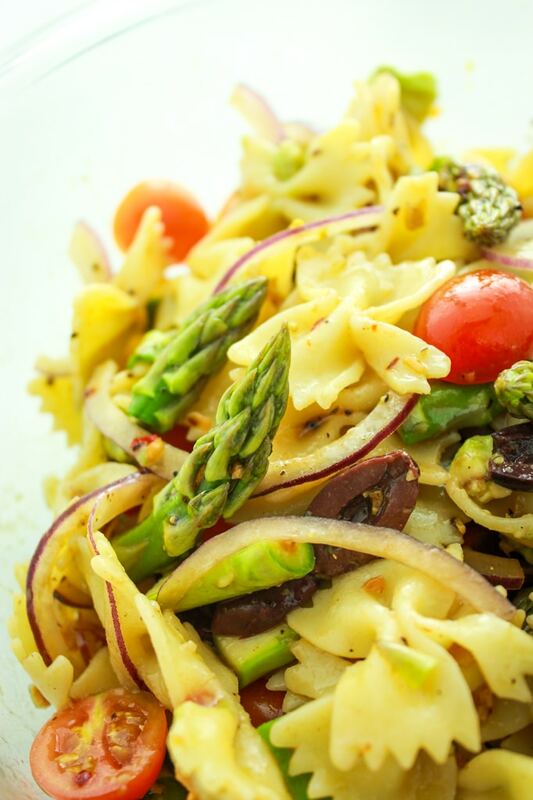 Make this vegan pasta salad recipe ASAP and tag us on Instagram! 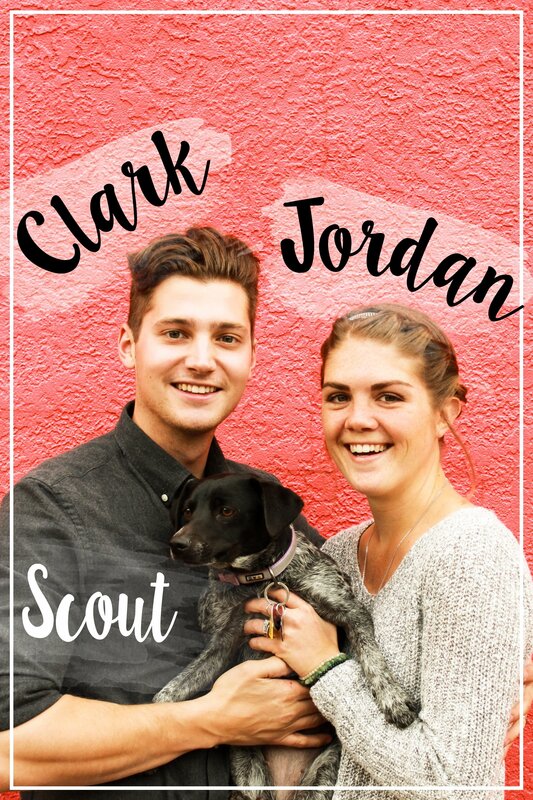 I love sharing your creations on our stories! Boil pasta until al dente. While pasta is boiling, add olive oil to a small skillet and heat to medium. Sauté garlic until fragrant, about 3 minutes. Remove from heat and set aside. Drain the pasta and allow it to cool. 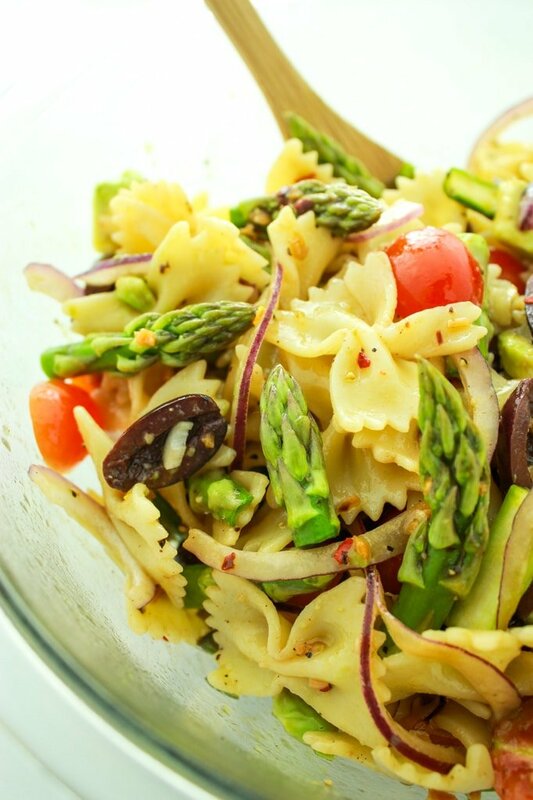 In a large bowl, add cooled pasta, asparagus, red onion, tomatoes, and olives. Pour the dressing over top and stir to combine. Serve cold, or heat it up on the stovetop for dinner! This serves about 8 people as a side. Nope, honey is not vegan! Which is why the recipe calls for maple syrup first, and honey as an alternative for those who are not strictly vegan. This recipe was a big hit. I would highly recommend it and will definitely be making it again. Awesome! I’m so glad to hear that – thanks for the feedback! can i omit the white wine vinegar for white vinegar or apple cider vinegar? Sure! That should be fine! Wanted a different salad to bring to an event so that there wouldn’t be doubles. Which was the case and I got a lot of compliments. People really enjoyed it. I will be making this salad for summertime potlucks! Yay! I’m glad you liked the salad – sounds like it was a hit! 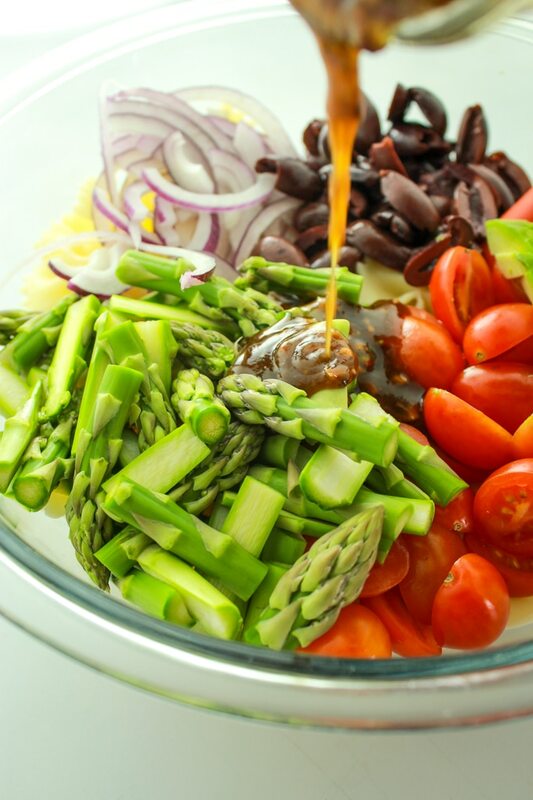 Delicious and perfect summertime salad! I swapped 3 tablespoon of white balsamic vinegar for the oil as I don’t use oil and put the minced fresh garlic in the salad without doing the sauté. No cooking!! I will make this often!! Yum! This is terrific, and so easy to prepare. I also sauteed the asparagus with the garlic. I also added half of a yellow bell pepper I had handy. I am passing the l ink for it on to friends. Thank you! Will Banza chickpea pasta work? You can definitely use banza! When I sautee the garlic I add the asparagus for just a few minutes to wilt it slightly. I make this every sunday and take to work each day. This looks delish and I’m planning to make it for my son’s 2nd birthday BBQ this weekend!! Is the asparagus raw? I don’t think I’ve ever had raw asparagus.. 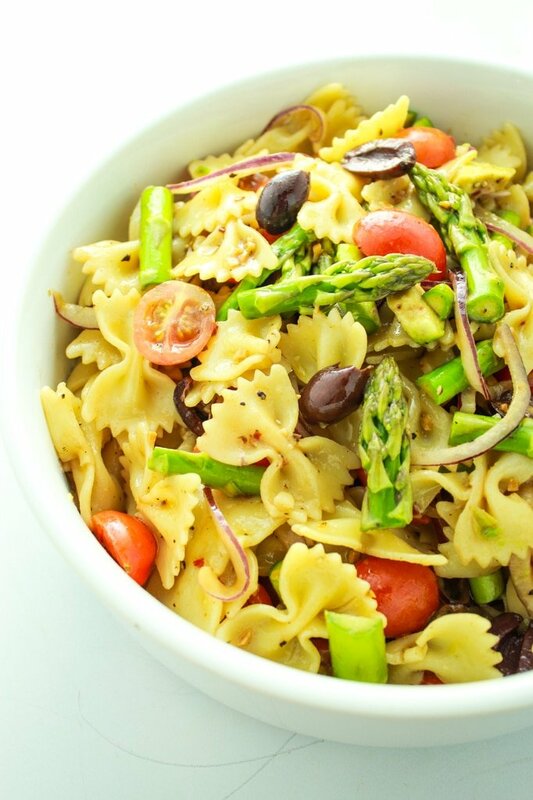 This pasta salad will be a hit, for sure! I left the asparagus raw in this dish, it’s delicious and crunchy. If you prefer, though, you could oven-roast the asparagus and then add it in.